We hear many, many stories from parents throughout California about their child’s educational experience. This one struck us hard. A dad of a graduating high school student in one of the most affluent districts in America, dubbed as “the best largest school district in all of California” shared his frustration. He explained that that his honors/AP/STEM daughter with goals of going to an engineering school and becoming an engineer, three-time letterman, community-serving, well over 4.0 GPA, scored well over 30 on the ACT, and a speaker at her graduation…. failed to get into ALL the UC schools in which she applied. This is a child and parents who did everything right. Why did she not get into the UC system, and what does this mean for your average California student? Newsflash: It means parents need to wake up, question, research, compare, and get VERY involved in their child’s high school experience. 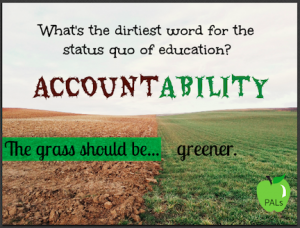 ACCOUNTABILITY…. the “A” word in education. 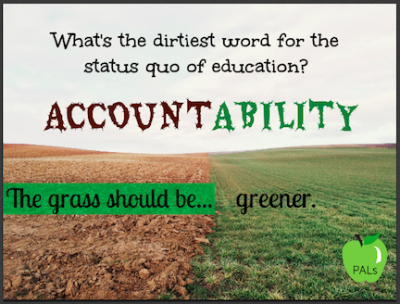 The status quo of education treats this as a dirty word. How dare anyone question teachers and their ability to do their jobs to the fullest, and for ALL students regardless of ability and socioeconomic status? How dare parents question a school district and their lack of transparency (another dirty word) in how our tax dollars are used? Why would parents even want to know comparable testing data, as if they would even understand it? Yes. Some decision-makers really think parents do not get it. Currently, California is ranked near the bottom in student achievement with Sacramento deciding the future of whether or not parents will have access to comparable data. By the way, we are on year three without comparable testing data. California…we have a problem. Parents need to DARE to ask questions about their child’s education. If not, your child may be destined for community college. Not that community college is a bad thing, if that is the plan. If not, you may be in for an unwelcome SURPRISE when your average student does not get into a four-year college. Here is a list that will help parents decide what is the best route for their child’s education, as well as who to vote for in local school board elections. What is the grade point minimum allowed of graduates? What percentage of your students are going to a four-year college? What programs are offered to students who need extra help or are parents required to hire tutors? How can I get my child in A-G and honors classes? Do you offer equivalent classes for both honors and typical students that not only meet A-G requirements, but also meet requirements for other universities? Do you give students their chapter tests and quizzes back for review? Are parents given the opportunity to meet with the teachers outside of union contracted hours? Are the high school counselors not only qualified, but directly assist students in college placement? Traditional public schools are not necessarily accountable to your child’s goals and ambitions. If you have a choice in your child’s high school such as public charter schools, magnet schools, home schools, or private schools…use it. Many school board trustees are bought and paid for by the teachers’ unions; therefore, they protect teachers, even the ineffective ones. Most teachers have tenure, so the best parents and students can hope for is that the teacher is willing to work with you and your child. When you find great teachers, who go above and beyond their union contract, celebrate them! Parents must start asking questions and do their own research. School districts are not accountable to your child no matter what their ability. This is your job as a parent. It is time we, as parents, step up and get loud for our children. It is time parents unite and demand accountability for ALL students.